Todo muy bien el personal muy amable, la habitación correcta , la comida muy variada, buenos espectáculos, visita diaria de Woody ....Lástima del tiempo que hay que esperar para poder entrar al restaurante, pues en algunos momentos se forman colas. 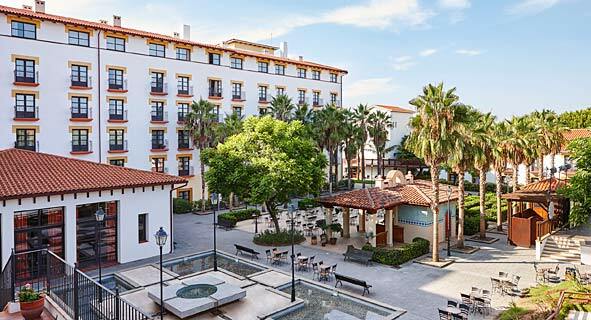 This family-friendly hotel is situated just metres from the popular PortAventura theme park. The Port Aventura train station is only 280 metres from the hotel, bringing guests quickly and easily to Tarragona's city centre as well as the region's bustling resort towns such as Salou and Cambrils. Additionally, Barcelona is only an hour's drive away. The hotel's spacious rooms are brightly decorated with a colourful and rustic Mexican theme. The two onsite restaurants serve international cuisines as well as festive Tex Mex dishes in a fun and friendly atmosphere, and the poolside snack bar offers tasty treats and refreshing drinks right next to the pool. Guests can enjoy access to the adventure park as well as reduced prices for golfing at the nearby golf course and lounging in the sun at the beach club, all during an action-packed an fun-filled family holiday in the Mediterranean sunshine.